Roosebeck 34.25 Inch Trail Dulcimer 4 String Lacewood. Fun, lightweight, and easy to play, our Trail Dulcimer has the rich sound of a mountain dulcimer with just a little bit of banjo twang. The body style of the Trail Dulcimer allows it to be played like a guitar instead of the traditional "flat in the lap" position of the mountain dulcimer. With a spruce soundboard over a carved lacewood body, the Trail Dulcimer produces a lot of volume for such a compact instrument. The Trail Dulcimer has three string courses: a wound string at the top, an unwound center string, and two unwound strings tuned in unison, at the bottom. The peg head features gold colored, geared 4:1 banjo style tuners. Many tunings will work, but we recommend the traditional DAD to makes it easy to pick up and play. 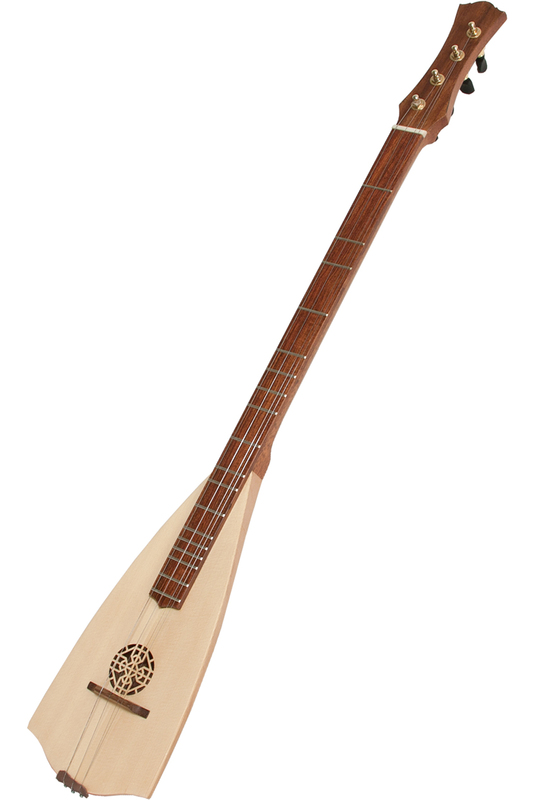 The frets are arranged in a diatonic scale, just like an Appalachian mountain dulcimer, but added is the infamous "6 1/2" fret just below the octave position allowing play in Ionian mode. The possibilities are many, playing the Trail Dulcimer can be as easy or as complicated as your care to make it. Explore! This is a beautiful instrument and it sounds great. It is a little awkward to hold, but I adjusted quickly. Also, the melody strings are VERY thin. You will want to play it often so that you build up callouses. Altogether very satisfied with this trail dulcimer.